Not all metals are created equal. Understand the differences between ferrous and non-ferrous metals. Copper and aluminum are considerably more valuable than steel. Whether you looking at job site scrap or examining a scrap sample from a manufacturer, profitable transactions start with proper identification. Metal pricing is strongly affected by daily market fluctuations, as well as other variables such as the type of metal, the amount of processing required to sort and clean material, the composition of alloys, and transport cost. One way to keep current is to subscribe to publications such as American Metals Market and Metalprices.com. For entrepreneurs, touching base with scrap metal buyers in your area will provide a framework for local price levels. Understanding the technical terms and vernacular of a particular industry can be critical in terms of communication and learning, as well as of quicker acceptance into that business community. There are numerous publications available. Get up to speed on the recycling industry more generally by subscribing to these publications, including Recycling Today and Construction and Recycling. Developing a business plan for your scrap metal business is an important first step in your decision-making and funding process. Make a point of visiting scrap metal vendors in your area, and speak to regional business brokers who specialize in marketing such operations. With some sources of material, a pickup truck and sales relationships with local scrap dealers, your business should gain momentum. 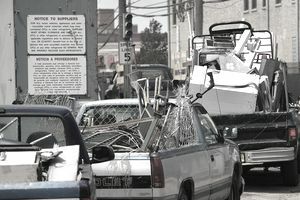 Scrap collectors may gather scrap metal from smaller construction and renovation sites, automotive shops, or smaller businesses. With a higher level of investment, one can start a recycling business or purchase a scrap metal business. Requirements include land and structure, processing and handling equipment, as well as working capital. One approach is to buy a recycling franchise. Starting a new site may be less costly than buying an existing business, but requires substantial industry-specific knowledge. Starting a new business from scratch is also a riskier venture than purchasing one with a proven operations record and highly experienced employees. Typically, however, successful existing businesses are priced at a premium, so the alternatives must be weighed. One of the benefits of participating in a mature industry such as scrap metal is that successful businesses are often run by industry veterans who may be looking to retire and be willing to sell at a fair price. You may choose to seek the advice of a business valuation expert with experience in this sector. Owning a scale is one of the key requirements for a business based on acquiring and selling metals based on weight. Processing requirements are minimal for the street vendor, but it is important to separate metals by type in order to maximize revenue when selling. In addition, make sure you have picture identification. Metal theft is treated very seriously by police and the recycling industry. Purchasers of scrap metal are required to record seller identification and vehicle license plate number. To protect yourself, always ask permission before removing material from private property. While it is possible to become a scrap metal vendor with just a little research, a few basic business connections and a pickup truck, a more serious and potentially more rewarding investment would dictate a thorough investigation as outlined in the metals business plan linked above.